In the last few years, many of our clients have enjoyed business success that has given their companies the opportunity to outgrow their existing locations. Changes in business size, logos, and signage needs grow along with the business. That is why several of our clients have reached out to us in the last few years to help them move and grow. One such customer was Charter Global. 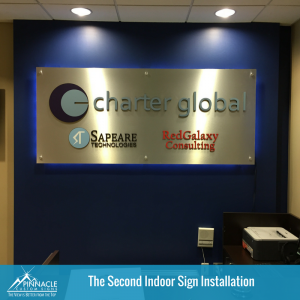 In the Fall of 2013, Stephen received a call from a prospective customer, Charter Global, asking about lobby signage. 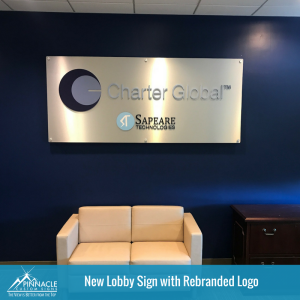 Charter had a lobby sign at their current location and wanted to move it to their new location. Stephen went out and took a look at the sign and determined we could move it and place it on a backer panel for easier portability. As the project developed, elements were added to the lobby sign. Pinnacle eventually ended up installing a back-lit lobby sign for Charter Global. The project encompassed removing the existing letters from the wall, creating a pattern, painting the letters to move toward the customer’s new logo color scheme, installing the letters on a brushed aluminum poly-metal backer, placing LEDs on the back of the panel and finally installing the sign at the customer location with stand-offs. The sign visually popped on the wall at the new location. 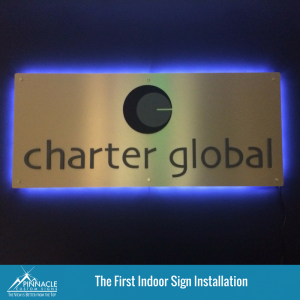 The standoffs and LED lighting made the logo come to life in Charter Global’s lobby. Fast forward to the spring of 2015, Stephen received a call back from the customer with a new request. They had added two companies and wanted to display them on a new lobby sign. We repeated the same process for consultation and development of a similar sign. Only this time, the Charter Global logo would be the primary logo with the other company logos featured smaller underneath the main logo. During the installation, we replaced the original in the lobby and re-located the old sign to the conference room with relative ease. This shows the flexibility, versatility and quick turnaround that can be achieved when moving lobby signs installed backer panels and mounted with standoffs. During the installation, we replaced the original sign in the lobby with the new sign and re-located the original sign to the conference room with relative ease. This shows the flexibility, versatility and quick turnaround that can be achieved when moving lobby signs installed backer panels and mounted with standoffs. Once again, in July of 2017, Charter Global reached out to Pinnacle. 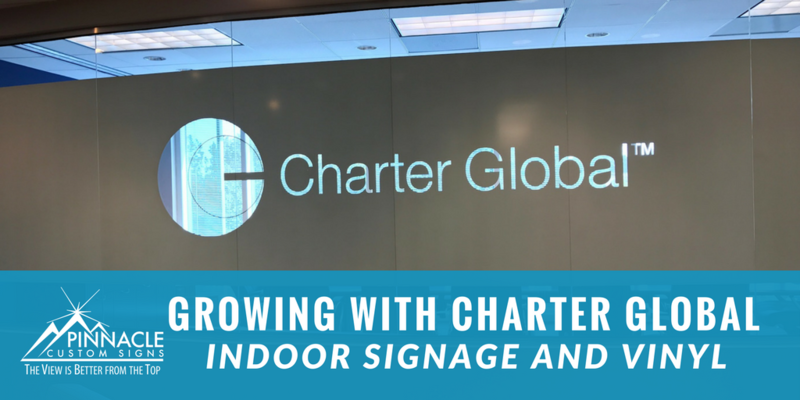 Charter has experienced continued growth over the years and was moving their offices once again. The new office location required that not only moving the existing two signs but also doing a few new things in the process. The new location featured a large conference room with all glass windows visible to the lobby. The company wanted to keep the glass but make it a little more private. Stephen discussed the possibility of frosted film over the glass panels to add privacy but allow the light from the windows. However, the next issue that came up was using the glass as a white board. The owners of the company wanted to be able to write on the other side of the glass like a large dry erase board without the writing showing on the lobby side. By simply using frosted vinyl people would be able to see the writing on the other side unless it was erased. 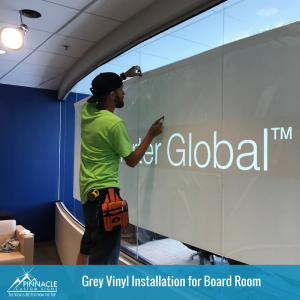 The Pinnacle team suggestion was a light grey vinyl that would be close to the look of frosted vinyl, but offer privacy and hide whiteboard marker on the lobby side of the conference room. After speaking by phone, we sent over samples of both materials applied to a small piece of acrylic for Charter to review. 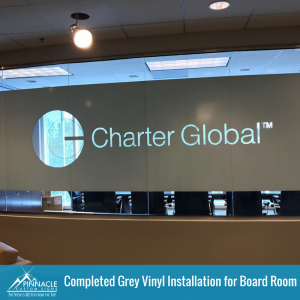 Charter decided to move forward with the light grey vinyl. Charter was extremely happy with the end result on this part of the project. The second new aspect of this project was incorporating the new logo adopted by Charter since the last install. Initially, we thought we could simply replace the “C” and “G” in the name to make the logo more consistent. Charter’s new logo has the “C” and “G” as capital letters as opposed to the previous logo with all lower-case letters. We removed the original signs and brought them back to our office to work converting the two letters. We discovered that the font between the old and new logo were very different and just replacing the letters would not work. To capture the new logo, we re-routed the whole logo for both signs and paint the letters to match their Pantone colors. After completing the repairs, we reinstalled the signs at the customer’s new location. Finally, there were two offices with sidelights the customer wanted to frost. Even the smallest elements of the office were included in the overall look for Charter. By incorporating the frosted vinyl on the sidelights, we could assist in the overall look and feel of the office spaces. Once we completed this phase of the project, the customer was overjoyed by the completed look as they move into their new office. Pinnacle’s vast experience with indoor signage and vinyl allows our company to be beneficial in multiple aspects of office design. We can develop indoor signage and vinyl designs to enhance your brand. Check out this video with a collection of our latest indoor sign projects or Contact our office today to discuss your office location or changes in your business location.